Not sure if I done this right. Any suggestions on how I should have this quilted. Oh you did a fabulous job! I really love the way the photos blend in with the other fabrics, they look like they belong there instead of standing out hollering 'look at me!' What is the name of the block you used? Quilts and cats just go together! Awww, this is great! As far as quilting, looking for others to suggest. Sorry! Can you SITD around the photos then do something different in the other areas? I'm very challenged when it comes to figuring out how to quilt something. Great quilt top! Are you sending it to a long armer? Many have books that you can look through to choose a design. If he worked for the railroad perhaps train tracks around the blocks with the pictures? Love what you made. I might consider what their occupations or loves might be and add that into the quilting. It will be really special whatever! maybe circles or feathers or just a nice meandering all over (not in the photos though). Great quilt!!! That is a lovely quilt. I love the fabrics that really complement the photos. And the theme makes the quilt very personal. Great job! Maybe SITD around pictures and circles on the rest as it's all straight edges. The pattern came from the April/May 2013 McCalls Quick Quilts. Tribecca is the pattern name. Page 20 Thank you for the reply. I'd like to thank everyone for their suggestions and nice comments. Will be taking it to have it quilted. Took a class in FMQ but never really practiced much. I always seem to have more projects popping into my head. My brother is leaving for Fla. in early Oct. and I wanted to give it to him before he leaves. 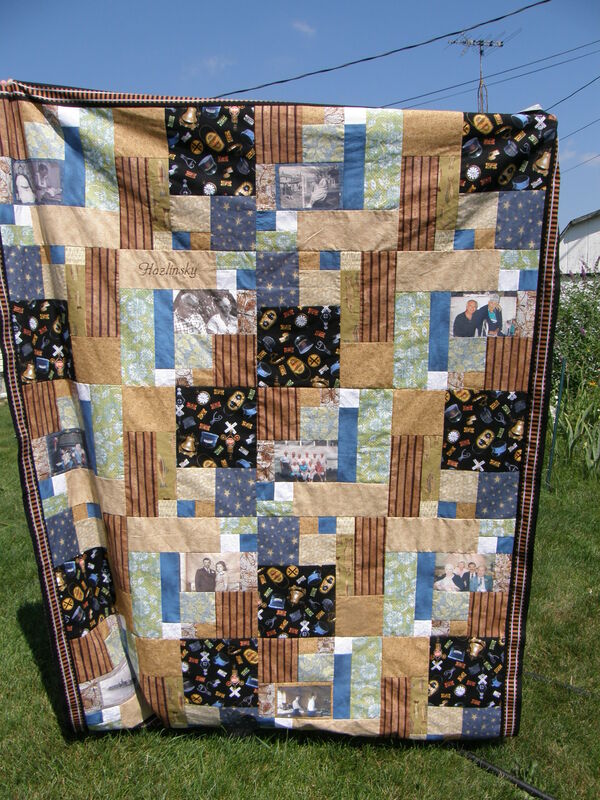 Beautiful memory quilt. Depends on your quilting skills. A simple meandering all over would be nice. That is one fabulous quilt, love everything about it. Quilting I have no idea but it will be treasured forever. What a wonderful quilt! I love memory quilts & yours has such great colors! Quilt with a simple pattern, nothing too busy. Neutral thread (invisible or a 60wt cream color). I sometimes quilt the outline of the people using invisible thread, but your blocks are small enough that you don't need to do that. Leah Day has two classes on Craftsy that each show 50 different FMQ patterns. She uses a quilt that is just different colored rectangular blocks, much like your quilt. Each block is FMQ'd with a different pattern. You might check that out. Another idea -- I made a quilt for my MIL that had some nice long rectangular blocks and had the LA-er put in dates that were special to her -- her birthday, my FIL's birthday, their 3 children's birthdays, their anniversary, their grandchildren's birthdays (she only had 3 grands). She loved it. That is absolutely gorgeous. I would prefer quilting in the ditch around the pictures and suggest channel quilting the rest. Wonderful quilt! A memory quilt is on my to do list. You have given me a new option. Lovely quilt. Would like to see it again once quilted. Good luck. Beautiful quilt. I think I'd just stitch in the ditch and let the photos be the star of the quilt. If you are going to let someone else quilt it they can add meandering on the other blocks.